Everything you could want from a bass, but shop around. The Pedulla MVP range has well over 30 years of history behind it - yet its popularity remains undiminished. Although they are less commonly seen than production line regulars such as Fender and Music Man, Pedulla basses command a certain ‘wow’ factor. Their visual beauty is there for all to see, and their sonic delivery is of the highest quality. This fretted five-string bears all the hallmarks you would expect and carries with it an equally hefty pricetag. So what does your £3500 buy you? The rounded body and slim upper and lower horns make for a very comfortable instrument, and although the upper bout sports minor chamfering, with no rear contouring at all, the contoured body outline works to the instrument’s benefit. The striking AAA flame figuring of the maple body is clearly seen through the polyester finish, while the chrome hardware, black controls and pickups, and dark ebony fingerboard contrast very well with the Arctic Blue body and matching headstock. Quality hardware in the form of a three-way Hipshot adjustable bridge, Gotoh machine heads and solidly attached controls has been used throughout, and overall the bass exhibits great balance, especially for a five-string instrument with a sizeable headstock and ‘three over two’ tuner arrangement. The slim D-shaped neck profile adds to the comfortable nature of the MVP because it’s sculpted to the curve of the player’s fretting hand; navigating the highly playable neck is a breeze. The rolled fingerboard edges are also a nice touch. The extensive lower cutaway offers unhindered access to the upper frets of the 24-fret ebony fingerboard, although we were surprised to detect a few sharp fret edges; this can happen with ebony timber, which has a tendency to contract over time, and it’s nothing to worry about. The rear control cavity is crafted from the body timber, providing a pleasing level of continuity, and the wiring is neatly laid out within the well-shielded cavity. The overall impression is of a solidly built bass, crafted from the finest materials. With a 17.5mm string spacing, broad fingerboard and good string tension across the whole neck, the MVP is a real joy to play. The bass sits perfectly against the player and resonates smoothly as you get to grips with its nuances. Plugging in, the bass has presence and even response across all five strings; the low B string is particularly impressive, sounding quite dark to these ears. The three-band EQ is a tad polite, certainly not extreme or excessive, despite offering 15dB of cut and boost in the bass and treble ranges. The amount of midrange boost and cut is at the player’s discretion via a trim pot in the control cavity, along with a further trim pot which adjusts the overall output of the instrument. The pickups and circuit are perfectly suited to this bass and bring the ‘woody’ character of the instrument to the fore, the pickups themselves having quite a specific tone. However, we had expected a slightly glassier treble response and although the bass EQ is powerful, it isn’t overpowering. The mid-switch does a fine job, bringing some extra punch into play. Soloing both pickups and panning across the tonal possibilities, there is a varied selection of tones on offer here. A bass of this calibre is capable of a fine display in any musical situation, so it’s not surprising that it sounds mightily impressive in a variety of musical genres. Fingerstyle tones are precisely conveyed, pick tones stand out very nicely indeed, and slappers and tappers are also catered for with some fine percussive tones. As with any bass, a little experimentation with the EQ and pickup options is worthwhile, although we don’t think this bass has a weak tone in it. It truly is an impressive bass of the highest quality with a fine frequency response, sustain for days, and comfort and playability by the bucketload. It isn’t much of a surprise that this is a very pleasing bass on all levels. The tonal options will work for most players and playing styles and overall this is a seriously fine bass. On the other hand, you look at the pricetag, and the state of the pound against the dollar might put a dent in your enthusiasm. 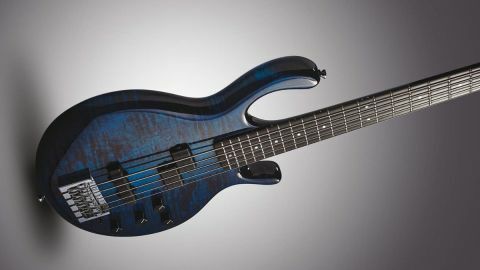 Some may argue that other basses could do the same job at a lower price point, so check out the competition before you commit.